The concept of ‘Girl Power’ has evolved and gained momentum over the years and today is more relevant and prevailing than ever. So, when your little girl looks in the mirror, it is only right that she be prepared to meet the new face of heroism and empowerment. Every girl is a Supergirl and now, your special girl can be her own beautiful superhero with the new make-up line from Supergirl Play-cosmetics. Supergirl is a well-known superhero character from the pages of DC comics. Supergirl Play-cosmetics offer water-based, skin friendly, gentle on the skin make-up, which are the perfect for those little girls looking to express themselves for who they are. These fun, funky little carry cases are bursting with glitters, glosses, eye shadows, lipsticks, nail polishes and blushes and are a great way to see the Supergirl in your precious little girl. Supergirl play-cosmetics can be trusted, safe and ‘make-up mishap’ friendly. Better still, the make-up water based and can be just washed with water. 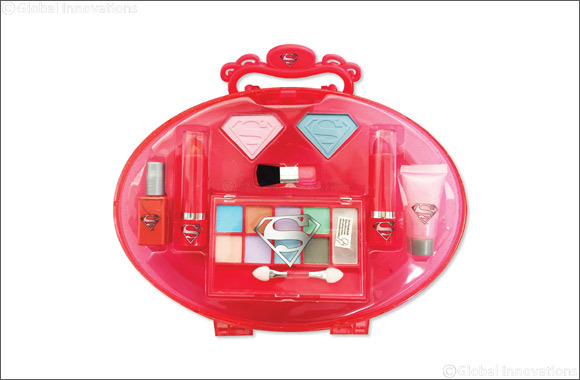 The My Heart Makeup Case (with real nail dryer) AED 89.00, contains 5 shadows and blushes, a lip balm, lipstick and a glitter gloss as well as 2 nail polishes with a cute Supergirl cape design and an inbuilt nail dryer to accommodate your Super Girl’s busy schedule!